I am the worst petrolhead in the world. It’s official. Until a week ago, I had never heard of the Bluebird, or Malcolm and Donald Campbell. I didn’t know about their record-breaking land and water speed achievements, and I didn’t know about the recovery of the Bluebird in 2001 at Coniston Water in which Donald Campbell was killed in 1967. All that changed when I visited the Bluebird exhibition at the Lakeland Motor Museum in Cumbria, a tardis-like annexe at the stately home of Holker Hall. According to its leaflet, the museum had planned to move premises last year but the move was postponed. When you go there you can see why this would be such a daunting task – the array of exhibits (30,000 apparently) is dizzying, from a 1920 Triumph Junior motorbike to a 1981 DeLorean. The walls are completely covered with framed posters from 1920s race meets, random road signs spanning the last 100 years, and a slightly odd and scary clown on a bike. Remember those early driving sim games which were hilariously basic but ridiculously addictive? Stick 10p in the slot and you get to drive a model car along a large wooden roller while trying to keep it on the ‘track’. Outside, the courtyard is flanked by a replica garage from the 1930s, complete petrol pumps, assorted rusty garage paraphernalia and even a 1920 Ford Model T van which looks as though it came flatpacked from Ikea. On the other side is a row of more modern cars including a Rover SD1, a 1971 Trabant and a mock-up of the Ford Focus WRC car. But the piece de resistance is the Campbell-Bluebird exhibition, with the full-sized replicas of the K7, Malcolm Campbell’s 1935 Bluebird car and his 1939 Bluebird boat. Scale models, photographs, text displays and videos complete the show for the Bluebird-Campbell novice. The display, featuring video footage, a full-size replica of the Bluebird hydroplane amongst other memorabilia, was absolutely fascinating. The determination, dedication and sheer bravery (or foolhardiness, depending on your view) of father and son is writ large. Donald Campbell was infected with the speed bug from an early age. His father, Sir Malcolm Campbell, was the holder of 13 land and water speed records in the 1920s and 1930s, which started when he was caught by the turn-of-the-century version of a speed trap riding his pushbike at 27mph down Box Hill with his hands in his pockets. But he was going quite a lot faster than 27mph in 1922 when he made his first attempt at the British World Land Speed record at Saltburn Flats in Yorkshire, and a whole 119mph faster when he broke the record for the first time in 1924. He went on to break the same record nine more times between 1924 and 1935, the final record at over 300mph. He also managed to find time to win the 1927 and 1928 Grand Prix de Boulogne competing in a Bugatti. The ever-present danger of crashing on land wasn’t enough so Malcolm decided to set the water speed record four times, the last fated attempt at Coniston Water in 1939 at over 140mph in the Bluebird K4. The Bluebird name was adopted from the play ‘The Blue Bird’ by Maurice Maeterlinck and Malcolm had used it first on his cars (along with fascist insignia – he had links to the British Union of Fascists). Malcolm was knighted in 1931 and, unlike other holders of speed records of the era, died of natural causes in 1948. Malcolm was clearly luckier than most and certainly luckier than his son, Donald. At the age of 18, Donald fractured his skull in a motorbike accident and then went on to fracture it again a year later in a collision with an army truck, though neither incident seemed to diminish his desire to hurtle across land or water at extreme speed. His early careers in the City of London and as a salesman proved unedifying and Donald quickly followed his father into powerboat racing, buying the Bluebird K4 from his father’s estate after his death, though this disintegrated at 170mph during an attempt on the water speed record in 1951 at Coniston Water. His personal life was also somewhat lively – he was a charismatic and dashing man who was married three times, the first to Daphne Harvey in 1945 without his father’s knowledge and then divorced in 1952, the second to the 23 year old Dorothy McKegg, an actress and singer in 1952 who he then divorced in 1957 and the third and final marriage a year later to Tonia Bern, another singer who later wrote a book about their life together, ‘My Speed King’. Work started on the Bluebird K7 in 1954 with Lew and Ken Norris, two engineering brothers who designed the boat with speeds of up to 500mph in mind. The new boat had a metal rather than wood hull, so in theory could withstand more stress. It cost £18,000 to build, money which Donald found by remortgaging his house, presumably to the displeasure of his wife at the time. It was complete in late 1954, but a series of technical problems meant Donald wasn’t ready to attempt the record again until 1955. The attempt was successful, leading to a further six records being set by him between 1955 and 1964. Never one to let the grass grow under his feet, Donald decided shortly afterwards to attempt the land speed record as well and started building a car (also called Bluebird) in 1956 with the aim of achieving at least 400mph. The land-going Bluebird took five years to design and build. Donald’s third skull fracture occurred in a near-fatal crash at 360mph while on a trial run. By 1964 it was rebuilt and Donald set the land speed record at 403mph. In an astounding petrolhead achievement, he also set a new water speed record the same year of 276mph in Australia, leading to the somewhat circular record of being the only person to hold both water and land speed records in the same year. Donald’s fiercely competitive nature meant that when an American threat to break the 300mph water speed record came in 1966, he was once again galvanised into action. The Bluebird K7 was redesigned with a tail fin from a Hawker Siddeley ‘Gnat’ plane and on 4 January 1967, he and his team were to be found on Coniston Water attempting the 300mph record. He clocked 297mph on his first run, then turned around for a return run before waiting for the wash to subside, a small piece of impatience which proved fatal. At 328mph, the Bluebird rose out of the water and flipped backwards. Donald was killed instantly. The boat cartwheeled across the water, breaking into pieces and finally sank seconds later into 150 feet of water. Royal Navy divers later found the hull, steering wheel, seat belt and Donald’s lucky mascot but were unable to recover his body. In 1997, a diver called Bill Smith was inspired by the Marillion song ‘Out of this World’ (which was written about Campbell and the Bluebird) to locate the wrecked boat. They were successful, and the Bluebird was raised in March 2001. Donald’s body was recovered in May and he was finally laid to rest in September 2001. Back at the Lakeland Motor Museum, the replica which forms the main part of their exhibition was built by the BBC for their 1988 film ‘Across the Lake’ starring Sir Anthony Hopkins. Restoration of the K7 is also underway and will eventually be on display in the Ruskin Museum, Coniston. 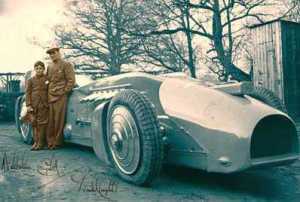 Malcolm Campbell once said to his son that he would never be like him. He wasn’t. He achieved more. He was posthumously awarded the OBE and in 1955 the CBE. He had also received the Seagrave Trophy four times. Father and son had set a total of eleven speed records on water and ten on land and are considered true British heroes, the speed kings of the 20th century. ← Why Are We So Shocked By The Snow?